If you want a hearty, healthy soup that is beyond delicious, you will love this recipe. It’s just spicy enough and soooo satisfying! Heat coconut oil over medium heat; add onion, garlic, and fresh ginger. Cook until onion is translucent then add carrots and sauté 5–7 minutes. Add curry powder; cook for another 1–2 minutes stirring constantly until all vegetables are coated and flavors combined. Add vegetable broth, coconut milk, diced tomatoes, apples, and lentils. Cover and bring to a boil on medium high heat; reduce to simmer (low heat). Add Lemongrass essential oil and cook for approx. 30 minutes until lentils are cooked through. Season with salt and pepper to taste. Optional: Garnish with 1 tablespoon fresh chopped cilantro and 1 tablespoon sour cream. This recipe was adapted from this recipe on Doterra’s blog. I wasn’t always in love with Frankincense. As a child being raised in the Catholic church, I’m sure I wrinkled my nose when I smelled the strong and distinctive smoke of the incense. It always seemed like an olfactory assault to me. Now it’s a familiar throw-back and I admit it stirs me at a deep level. I had sampled off-the-shelf Frankincense essential oils at the health food stores over the years. It never appealed to me… but I kept trying to like it. I was intuitively drawn to the mysterious substance and thought maybe, like yogurt, it would grow on me if I kept trying it in tiny doses. About two years ago I was lucky enough to attend a yoga class that was incorporating essential oils into the practice. Near the end of the class, in preparation for savasana (relaxation/meditation), the teacher came around and placed a drop of Frankincense in each student’s open palm. We were instructed to apply the Frankincense to our third eye, in the middle of our foreheads. I wasn’t crazy about the aroma but whoa! it smelled familiar and somehow ancient. Almost immediately after applying the Frankincense to my forehead, I felt tears streaming down my face. No accompanying sadness, just gentle, streaming tears. I enjoyed a deep, releasing savasana, and felt a bit high coming out of meditation, but grounded. This was a yoga retreat and the following day, again during yoga, the same thing happened. We were given Frankincense to apply again during savasana, and once again, the tears came. Again, no sadness, just tears. And curiosity, of course. This was the first time I had ever experienced this type of Frankincense. This was top of the line – pure and potent essential oil which was carefully harvested from generations-old trees in Somalia. It had an immediate and profound effect on me so when I got home from the retreat I started researching all about Frankincense. I learned that scientifically, Frankincense is very high in sesquiterpenes. These chemical constituents stimulate the part of the brain that controls emotions. Sesquiterpenes delete bad information in cellular memory so that corrections and healing can take place. Word got out that I was selling high-end therapeutic Frankincense and I started getting phone calls from cancer patients who were referred to me. I could not keep Frankincense in stock because now scientific studies were coming out about Frankincense shrinking tumors. I can verify that the moles and skin tags on my own body continue to shrink and disappear as I continue to apply Frankincense consistently and often. That’s why I also take 2 drops under my tongue morning and night. If it works on outside skin mutations, it must work on any internal mutations as well… right? This was a suggestion I learned in a webinar by Dr. Axe, who teaches a proactive approach to wellness. Let’s just say I haven’t even had as much as a cold in over a year, and I think it’s because I’m fortified with Frankincense! Frankincense is considered the “King of Oils” because the saying among oilers is, “When in doubt, use Frankincense.” That’s exactly what I did when I woke up one morning with horrible anxiety. I didn’t want to feel that way! I grabbed my nearby bottle of Frankincense, took three or four deep whiffs and I immediately calmed down. That was the beginning of my love affair with Frankincense. My hero (sigh). Frankincense also amplifies whatever other oils you may be working with. For example, if you are using oregano or melaleuca to support healing from an infection, adding Frankincense will enhance the effectiveness of the other oils. Even though Frankincense is on the expensive side ($69.50 wholesale), it’s still a lot cheaper than Xanax, or a nervous breakdown, or a trip to the vet (yes I use Frankincense to support my senior dog’s wellness). There are 250 drops in a bottle and all you need is one or two drops per dose. When you break it down, it’s a good value (and I get my Frankincense free, by the way. I can show you how you can too if interested). So why would I love Frankincense if it made me cry? Frankincense seems to correct what needs to be corrected – physically, emotionally, and spiritually. Frankincense helped bring to my conscious mind a sadness within me that needed to be dealt with. Until I used Frankincense that day, I had been successfully burying my pain by denying it existed. How can I be authentic if I’m hiding something from myself? Frankincense facilitates communication between your perfect soul-self and your disconnected ego-self. Physically, Frankincense has been proven to permeate the blood brain barrier. Emotionally, Frankincense permeates the veil that masks our authentic selves. Spiritually, Frankincense is uplifting and grounding at the same time. That’s why it’s so often used to enhance spiritual practices like yoga, prayer, and meditation. I’m still getting to know Frank (as I’ve started calling His Highness). He continues to impress the heck out of me and he’s my hero on a daily basis. Even though we’re having a love affair, I’m not possessive. I’m glad to share Frank with the whole world! This is an easy and often appreciated gift for the holidays or any time of the year. You can add this sugar to hot or cold tea, or any other food or beverage that you’d like to sweeten with a delightful spicy flavor. NOTE: Use essential oils that are pure enough for ingesting. I use doTERRA essential oils. Multiply the amounts for larger quantities. For example, the 6 oz. gift jar pictured above has 6 Tablespoons of sugar, and 3 drops of each of the essential oils. Close the jar tightly, shake, enjoy! Preheat oven to 350 deg. Coat bottom and side of 8″ x 8″ baking dish with coconut or other vegetable oil. Peel and slice peaches. Arrange sliced peaches on bottom baking dish. Combine remaining ingredients with a pastry cutter until evenly crumbled. Spread crumb mixture over top of peaches and spread evenly, lightly pressing into peaches. Bake 35 min. or until golden brown. Making banana bread is my favorite way to use ripe bananas… and adding a touch of lavender makes the bread a special treat. When adding essential oils to food recipes, make sure you are using a therapeutic grade essential oil such as doTERRA, which is meant to be ingested. Do not use off-the-shelf oils which may be full of synthetic additives. Preheat the oven to 350 degrees. Coat a 9 x 5-inch loaf pan with non-stick spray. In a large bowl, combine the butter and sugar and mix until fluffy. Add the eggs one at a time, beating well after each addition. Stir in the flour, baking soda, and salt and beat into the butter mixture. 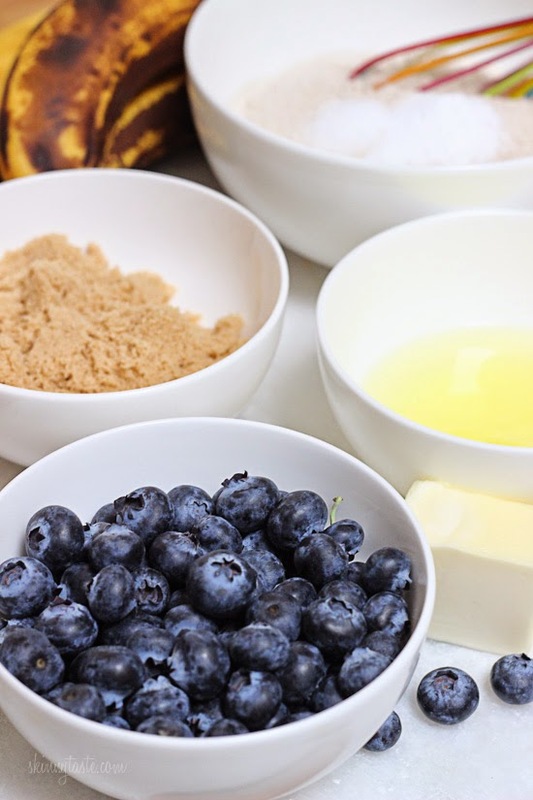 Fold in the bananas, blueberries, walnuts, lavender, and vanilla. Bake for 45-50 minutes, or until a toothpick inserted in the center comes out clean.